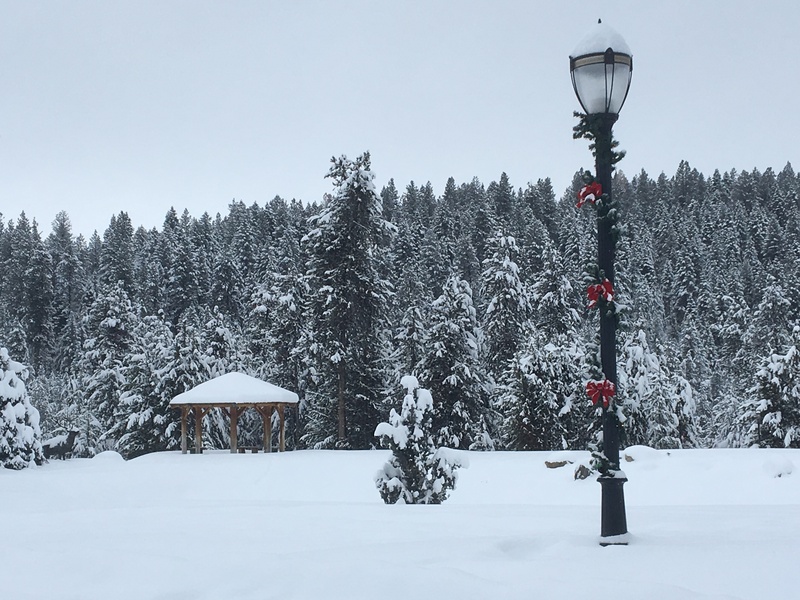 I awoke this Christmas morning to a foot of fresh powder in the wooded outskirts of McCall, Idaho. “Was this intentional?” you might well ask, knowing the astral ramblings I’m given to in this life. Is all bright? Getting there; still snowing. Before light, I took a huff puff in the new fluff, out to the road where I could walk on a plowed surface, spend less energy heaving the knees chin-ward with each step. I wandered about chanting into the muted scene, the slick stream of pavement running through it providing the only reverb. Standing still in the dark, performing Qi Gong for the Devas, I watched morning inflate the sky. So beautiful… and quiet, even as a little CAT snow-mover began shuttling around busily, like R2D2, making spirits brighter, and making the way safe for the humans waddling around, swaddled in down, through the near-zero-degree air. I ducked into the lodge where my friend Jack and others were, by now, breaking fast on the spread of edibles inedible to me. 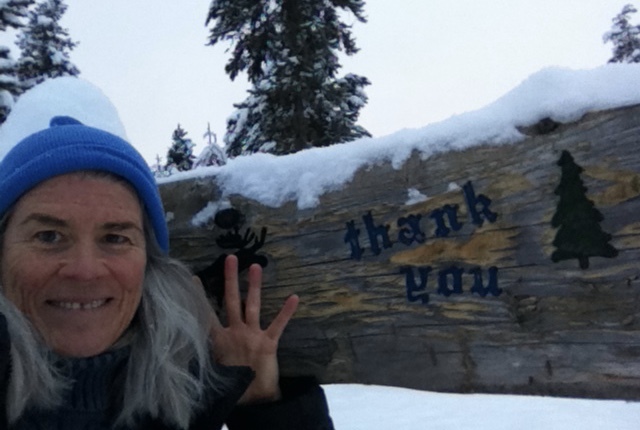 I continued out onto the deck to Lift Chi Up and Pour Chi Down, as pines reached for the sky and snow for the ground. Country Christmas songs cut a warm and tinny spiral of sound into the frigid air, and I felt my heart melt open as I blended with a world both arctic and plasmic and as Glenn Campbell’s transcendent “Silent Night” redeemed humanity. Don’t let the absence of sun, sand and palms fool you. This is an oasis from the colossal conundrums of my life. Once again I have allowed myself to be lifted out and reborn, if only in a bubble, to remember the why of life. 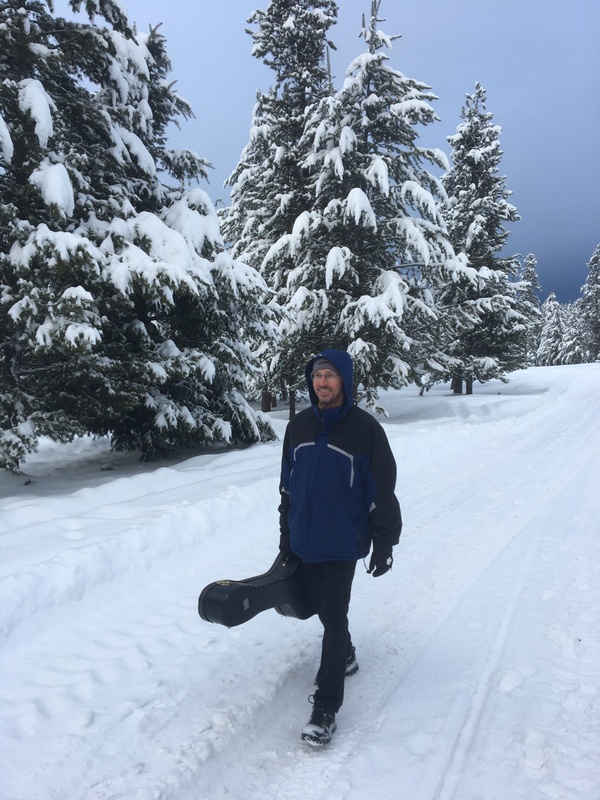 I may be here, ostensibly, to record some vocals on Jack’s holiday CD, and to capture photographs of “New Snow,” the title of the album. But I am here at Christmas, the celebration of light returning in the darkest time of year, in one of the darkest times of my life, to remember and harness the perennial rebirth and hope of this season, to remember and reclaim the Christ within and without. I AM ALIVE. Today, that is Miracle enough. That segues into a “poem” (below) captured from my day of travel to Idaho. But first the obligatory selfie echoing another of songs we’ll be singing on this week: “Thank You.” Already a Classic. as the line snakes down two gates to the Starbucks. I practice QiGong in a corner. I’d get more views on YouTube. for the rest of the room to see. to come share a hug and a smile on my layover in a once-home town. I pass through security twice. And what passed in Albuquerque is searched in Phoenix. …their thumbs tapping away on their glowing pacifiers. Everything hurts. But I AM ALIVE. It’s hard not to object; but I am alive. There is no airport mode. Sandwiched on an exit row between peanut and pretzel. Yes. The plane is full. My head is full; my mind is empty. More hope in my pocket than my heart. Why Wyatt? Wyatt is the name of our host at Bear Creek Lodge, who given his size and elusiveness might actually have been part Bear.